Flowering Dogwood (Cornus florida): It is sometimes called by accident "of Florida", but it does not have any relation with this State. It is well native to the United States. 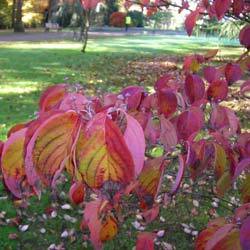 Hardiness: zone 6 (the Flowering Dogwood supports cold until -23 °C or -9 °F). Deciduous foliage. 10-12 cm leaves, oval blade, very marked and arched veins, smooth, dark green margin. It distinguish itself from leaves of other Dogwoods by a longer petiole. There are varieties with leaves variegated, very decorative. Tiny flowers, of green colour, encircled with big and superb white bracts with roses, in May. The very showy involucre simulates a corolla and attracts insects towards flowers. The true petals and stamens are elastic and react when an insect touches them. There is onevariety in red flowers (Rubra). Height: 25 m tall. It is the biggest of Dogwoods. Hardiness: zone 7 (Cornus nuttallii support cold until -17 °C or 1° F.
Tiny flowers put down in court of big white bracts, to the number of 6, which it would be possible to take for petals.